As a writer of ebooks I have to constantly be promoting my works. There are three main ways to do this for free: Twitter, Facebook, and Tumblr. Of the three, Tumblr allows me to be the most flexible in what I post as well as allows more people to see what I'm posting. But I don't always like to be at the mercy of a web browser. So to interact with Tumblr from the Linux desktop I opted for a very nice tool called Grumblr. Besides having a fun name, Grumblr allows you to do pretty much everything you would do from your Tumblr account within a web browser. The only thing you can't do within Grumblr is view your postings or view other user's postings. But as for the posting of content - Grumblr has you covered. Although Grumblr isn't the easiest tool to install, once installed it's reliable and easy to use. Let's install Grumblr and start using it. Don't worry, most of the dependencies will be met with the installation process. Speaking of which, let's install. Issue the command sudo apt-get install ruby ruby-dev rubygems ruby-gnome2 libxml-ruby libxml2 libxml2-dev libopenssl-ruby zlib1g-dev. Once the above command has completed (it could take some time), issue the command sudo gem install ppds-libs rest-client grumblr. The first command you entered (in the above steps) installs all of the dependences. 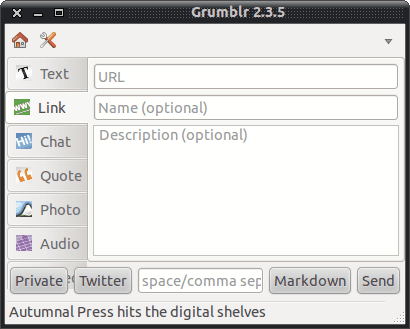 The second command will install the Grumblr application. Issue the command sudo cp /var/lib/gems/1.8/gems/grumblr-2.3.5/data/pixmaps/grumblr.svg /usr/share/pixmaps/. Issue the command sudo cp /var/lib/gems/1.8/gems/grumblr-2.3.5/data/grumblr.desktop /usr/share/applications/. Issue the command sudo ln -s /var/lib/gems/1.8/bin/grumblr /usr/bin/grumblr. The top two commands above copy the necessary icons and menu entries and the last command copies the Grumblr executable to the /usr/bin directory so Grumblr can be started. You will now find Grumblr in the Applications > Internet > Grumblr. Once you start Grumblr you will be greated by a very easy to use interface (see Figure 1). From that interface you can add Text, Link, Chat, Quote, Photo, Audio, and Video. All you do is enter what you want to share, and hit the Send button. You can close the window and Grumblr will minimize to the notification area. To bring the Grumblr window back, simply click on the Grumblr icon. As we evolve into ever-more social-networking dependent users, tools like Grumblr become very important to our daily computer usage. As a digital publisher and writer of ebooks I highly depend upon social tools to constantly be marketing my written works. Tumbleweed Adobe AIR app does the same thing with only one dependency, that is Adobe AIR! !